It is a question posed in 1994 in Mason, Michigan when William and Claire Dart shared an interest in education, more specifically in science, technology, engineering, and math. 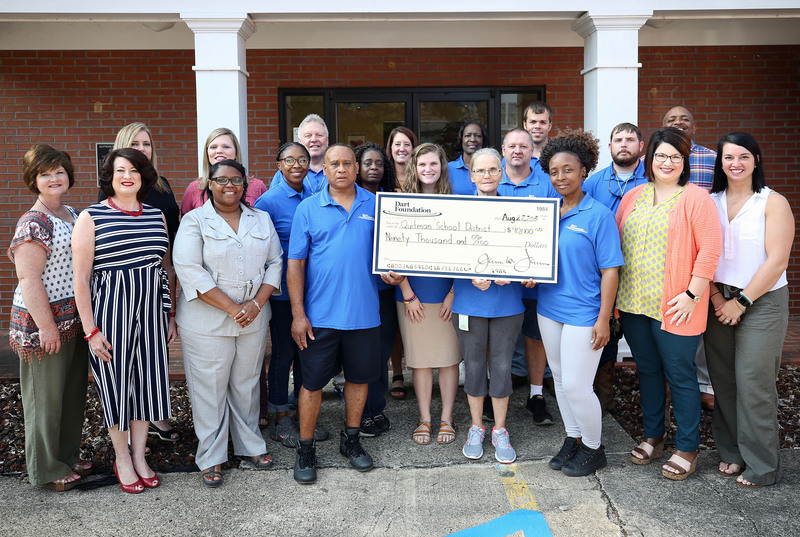 On August 22nd local Dart Foundation members and Quitman School District employees stood together in front of the district’s central offices. There they posed with a $90,000 check from the Dart Foundation to Quitman School District. Now the students of Quitman School District’s Lower Elementary, Upper Elementary, and Junior High will reap the benefits of the shared vision of the Dart Foundation and the schools’ administrators and teachers. Thirty thousand dollars will be spent by each school as they purchase software, necessary equipment, materials needed to support implementation of STEM activities, and provide professional development for their teachers. In the STEM Initiative, teachers will focus on robotics and engineering using LEGO EV3 and Rokenbok. Quitman School District’s overall goal is to establish a well-rounded STEM program that will be able to successfully compete around the state and world. The K-8 STEM Initiative Enhancement Project will begin on October 1, 2018, but much work has already been done. A very special thank you goes out to local Dart Foundation committee members Katina Gowdy, Robert Hicks, Mary Jo Ivey, Debra Douglas, April Terrell, Jerry Hinton, Jeremy Holifield, Billy Wilson, Jeraldean Stokes, Kisha Mathis, Latoia Wallace, James Grayson, and Ranessa Ford as well as Quitman School District grant writers Minnie Dace, Tracy Dearing, Cynthia Napp, Chrissy Kelly, Laney Brown, Elise Slay, and Elizabeth Fisher. Also, our gratitude extends to our administrators Toriano Holloway, Amanda Allen, Leah Ivey, and Bill Russell for their continued support.